This is an ongoing series in which you will get to know a little bit more about the fine young men and women who prepare your coffee at Kean Coffee through a series of random interview questions. Ramone Valerio has been a barista at Kean Coffee Tustin for close to two years. Aside from being an awesome barista, Ramone is also a talented musician, and an extremely creative and all around great guy. When he isn’t making amazing coffee drinks for our guests, Ramone can also be found playing music with his fellow musicians in the coffeehouse. A true Renaissance man. 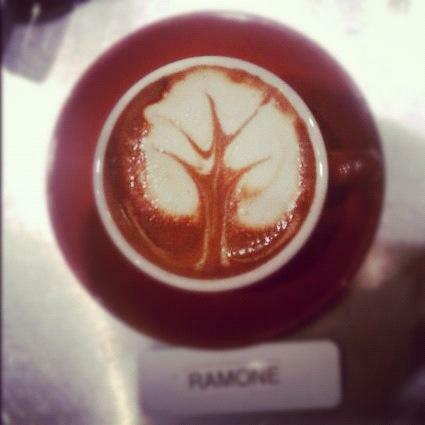 That’s why we love Ramone! KC: What is your favorite coffee drink? RV: Caffe Napoli or a “Napiato” (macchiato with a little white chocolate and hazelnut). KC: What is your favorite thing to do on a Saturday, (assuming you have the day off)? RV: Playing shows/concerts, jamming with the band (I, of Helix). KC: If you could travel to any place in the world, where would you go? KC: What is a fun fact that most people don’t know about you? RV: I like to draw and also enjoy video editing. KC: Who was your favorite band/musician in high school? KC: What were your most favorite and least favorite Halloween costumes ever? RV: Favorite was when I dressed as Luigi from Mario Brothers. Least favorite, John Travolta from Pulp Fiction. KC: Which of your personal traits or skills are you most proud of? RV: Playing bass for almost 10 years, writing music, making CD’s/albums. KC: Who was your idol when you were a kid, and why? RV: Jackie Chan, because I wanted to Kung fu around the world. Next Post Recognize this guy? Meet Dwayne Carroll! He has talent as a barista and musician! !